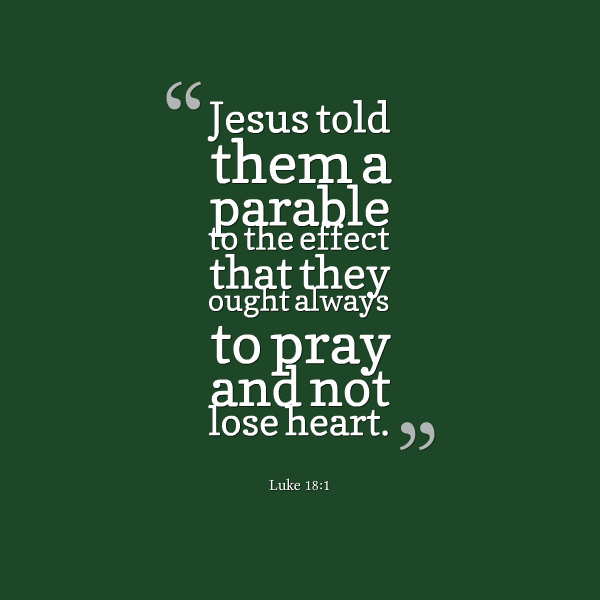 Jesus tells a story to help his closest followers keep praying while they wait for the coming of God's kingdom. What will I do in the crises that I'm going to face today - will I ask God to save me or will I spend today trying to save myself? God is nothing like this judge - he listens and responds when I need his help. He blesses and blesses and blesses and he promises to come through with impeccable timing. How often is my failure to pray an indictment on my frustration with God's timing and my lack of belief in his willingness and ability to help? I've turned prayer into an infrequent, episodic, formalized event that puts my unwillingness to trust God in pious language. The way forward is not a plan to pray more in 2014; the way forward is throwing myself on the mercies of God in the hope that he might pry open my soul to the glories of 'Jesus, ready stands to save you, full of pity joined with pow'r'. This doesn't mean that rhythms and patterns of prayer are unnecessary or unhelpful. My hope is that God will transform practices of prayer into something that transcends ritual. Father, save me. Give me the persistence of this widow to ask and keep asking for your help, as the Spirit reminds me how desperately I need you and how willing you are to help.